Rose Builders Ltd/ Rose Group Ltd, a family owned group of companies, employs tradespeople, operational, commercial and office support staff in the construction industry, operating solely in the UK and are proud of the standards that have been applied to the business over many years. 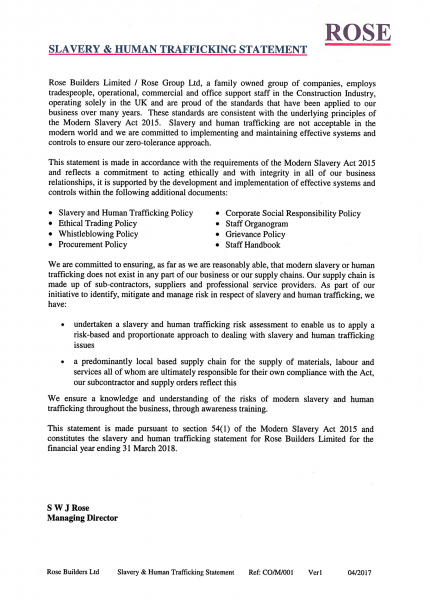 These standards are consistent with the underlying principles of the Modern Slavery Act 2015. Slavery and human trafficking are not acceptable in the modern world and we are committed to implementing and maintaining effective systems and controls to ensure our zero-tolerance approach. We ensure a knowledge and understanding of the risks of modern slavery and human trafficking throughout the business, through awareness training. This statement is made pursuant to section 54(1) of the Modern Slavery Act 2015 and constitutes the slavery and human trafficking statement for Rose Builders Ltd for the financial year ending 31 March 2018.